The mobile stations can be used as an enrollment station for electronic fingerprinting, as a terminal of remote access to the Central AFIS resources and as an express ID checking workstation. 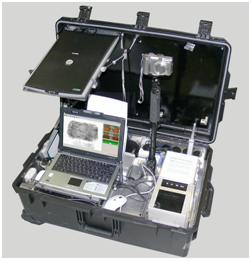 The mobile stations provide on-the-spot access to the AFIS databases through any wire communication channel supporting IP connectivity, and through wireless connectivity as well whether it is GSM or CDMA. BioLink Mobile RS is designed to capture all the needed information during the process of booking subjects under any environmental conditions and for real-time identification. 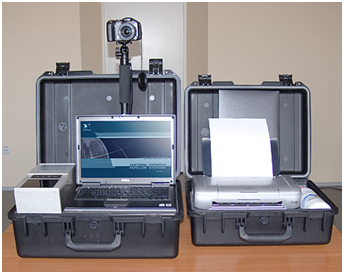 All the components of BioLink Mobile RS are incorporated in two ruggedized transportable cases. 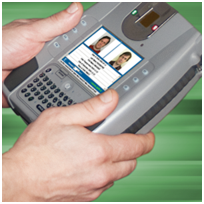 With one of these cases, containing a notebook, a fingerprint scanner and a camera, you can quickly and accurately create high quality electronic tenprint cards and verify the identity of subjects in the field. With facilities from another, smaller, container, you can print out any information. Among the benefits of this mobile complex is its versatility, making it useful for many tasks, and compactness enabling easy transportation. All facilities are housed in a shockproof transportable case. BioLink RS Professional Complex is especially designed for forensic technicians to provide on-the-spot access to automated fingerprint/palmprint databases and resources for fast and reliable results in any environment. BioLink RS Professional Complex is able to operate independently, i.e. as a stand-alone BioLink AFIS, booking station or express ID check terminal, or to be a part of a network operating as a remote BioLink AFIS station. 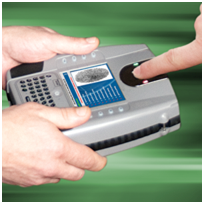 DPP-5 is a compact handheld device with an embedded fingerprint scanner that is especially designed for the growing needs within in-the-field identity checks through enquiries to the AFIS databases using subjects’ touch fingerprints. Equipped with a high-resolution touchscreen, 37-key keyboard, and a built-in card reader (SMARTCARD) for the verification of ID documents.